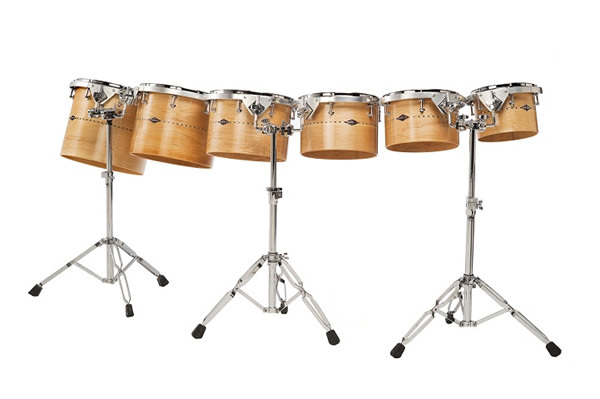 The Craviotto Solid Shell Maple Concert Toms provide focused tonal definition, outstanding projection, and superb tone. Each steam bent solid shell single headed concert tom is handcrafted by Johnny Craviotto. Equipped with Craviotto signature diamond tube-lugs, heavy gauge 2.3mm counter-hoops, Remo drumheads, and Gauger RIMS mounts; The Craviotto Classic-Series Solid Shell Maple Concert Toms offer a wide range of tuning possibilities, while producing a tone that is warm, focused, and musical. The tuning range on these drums is huge. Use a set of two for extra added color to your existing Craviotto set or another set. The 7.5x10 and 8x12 make incredible timbales!! Possibilities are endless here. Expand the tonal palette of your set today. Also available in all other wood including cherry, walnut, birch and ash at 15% upcharge, and in mahogany at 25% upcharge. Maple pricing shown below. Floor stands not included. The Craviotto Solid Shell Gong Bass Drum is available in 10x18”, 10x20”, 10x22”, and 10x24”models. Handcrafted by Johnny Craviotto, each steam bent solid shell “Gong Drum” comes equipped with Craviotto chrome-over-brass hardware, Remo drumheads, and Gauger RIMS mounts. The Craviotto Custom-Shop Solid Shell Gong Bass Drum produces a full tone with excellent sustain, as well as the tuning versatility of the legendary Craviotto one-ply solid shell. *Available Wood Species: Maple, Walnut, Cherry, Birch, Ash. Prices below are for maple. Other woods are a 15% upcharge. Prices do not include floor stands. 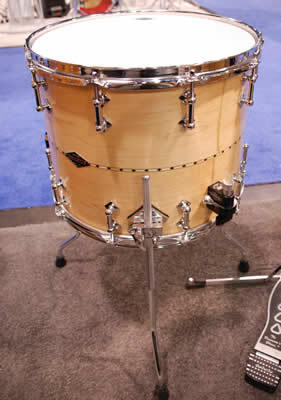 The Craviotto 12x15 Baritone Snare was the hit of NAMM! The design for this drum came about as a result of playing the Craviotto 12x15 orchestral snare. The sensitivity of that drum was so fine, that we envisioned a standard snare bed on a drum with legs that could serve as an auxiliary snare and also serve as an additional tom. The snare sensitivity of this drum is beyond belief. Pricing and other details soon. Meanwhile, call Steve for more information and to get an order in queue. We have several of these already in production! Available in any of the current Craviotto wood selections. Craviotto will now make the Unlimited series lug available for drum sets. The first prototype set will be in our NY store very shortly and we will post photos. This provides an excellent option for people who prefer this lug design over the more traditional tube lug. More details coming soon! Craviotto is introducing an 11" diameter tom. This size provides excellent versatility and pairs up beautifully with a 9x13 and also provides an extra option for the concert tom series as well. Excellent for those who prefer something just a bit larger than a 10" tom. The prototype will be in our NY store soon as part of a set that includes 7x11 and 9x13 rack toms, a 15x15 floor tom, and a 22" bass drum. The 11/13/15 tom configuration is also being offered as a new product option. In addition to the tradition 45 degree and 30 degree edges offered by Craviotto, we are now introducing a vintage "baseball bat" style bearing edge. This edge is similar to the rounded, warm sounding edge that was present on Ludwig and Slingerland vintage drums of the 50s and 60s. The edge is very round and cut with Johnny's incredible precision. The end result is an edge that gives a tremendous warm, fat sound to the shell. Try this edge on a mahogany solid shell kit, or, try it on a maple/poplar/maple hybrid solid shell. The maple/poplar/maple hybrid shell provides the sound characteristics of the vintage shells that used this composition, and when combined with the baseball bat edge it gives you incredible warm, fat tone with the sonic advantages of Johnny's incredible solid shell constuction.